Are you craving fall? Judging by my Facebook stream and the many references to Starbucks pumpkin lattes, I’m guessing that I’m not the only one excited for the crinkle of golden leaves underfoot. As the Chicago weather continues to zig zag between breezy and hot, I’m taking matters into my own hands and bringing fall into the kitchen. 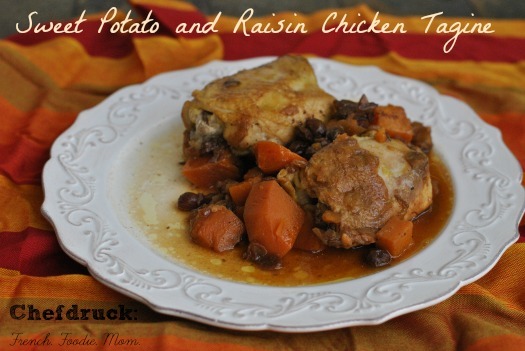 This sweet potato and raisin chicken tagine is golden and filled with honeyed root vegetables. It’s a celebration of all things fall and makes you want to curl up and watch the leaves change colors. This sweet potato tagine fills the house with the aroma of cinnamon and sweet onions, but then lets you get on with your life. Our nights are filled with three sets of soccer games and I can relax and focus on cheering on the kids, knowing this saucy chicken dish is cooking at home in my slow cooker. When everyone comes running back in the house, dirty and rosy cheeked, the only tasks standing between us and dinner are boiling up some water to make a batch of couscous and setting the table. Tagines are traditional Moroccan dishes, typically cooked in coned clay pots and served on top of a mound of steaming couscous. As Moroccan culture is closely tied to France, they’ve become part of the repertoire of today’s French food, and make a colorful and fragrant dinner. Tagines can be spicy or sweet and can be made with a variety of different meats, although predominantly lamb or chicken. To learn more about tagine and dream of Morocco travel, here’s a pretty photo essay all about tagine from Legal Nomads and check out the delicious and beautiful Maroc Mama blog, written by Amanda who has just relocated her family to Morocco. 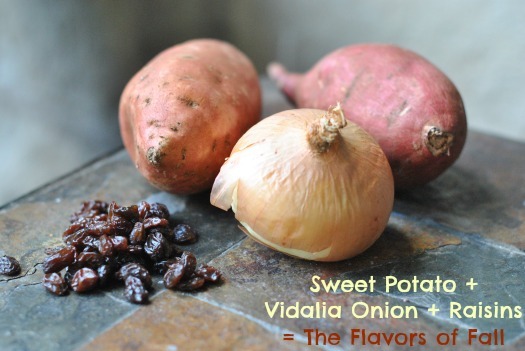 The recipe below calls for only two sweet potatoes, but feel free to throw in a few more. Even when the chicken is all gone, the leftover couscous mixed with the sweet potatoes and raisins makes a great leftover lunch. Throw it in a thermos and it solves the dilemma of school lunches for one day at least. This sweet and exotic dish is a great way to celebrate fall flavors. Warm and colorful, it makes great leftovers. Pour a tablespoon of olive oil in the bottom of a dutch oven and brown the chicken thighs, cooking 3 minutes on each side. Remove from the pan and set aside. If you happen to have a slow cooker that also sears, do all the prep in the same slow cooker and your sauce will be even tastier. Add another tablespoon of olive oil in the bottom of a dutch oven or cast iron casserole over medium-low heat. Now add the onion, stirring to coat it with oil, and cook on medium heat for 2 minutes. Add the cinnamon and the saffron cook for an additional five minutes, until softened and fragrant. Once the onions are soft, add the honey, chicken broth, and raisins. Throw in the chicken and the sweet potatoes on top and bring the mixture to a boil. Transfer everything to a slow cooker, set on high. Cover and cook for an hour and a half. Resist the temptation to lift the lid. The steam is what makes this dish so good. The dish is done once the sweet potatoes are soft. Feel free to reduce the liquid once the chicken is cooked. Just remove the chicken and sweet potatoes and boil the liquid in a saucepan until it is a consistency to your liking. Serve immediately, but don’t get rid of leftovers. This dish was even better the next day.